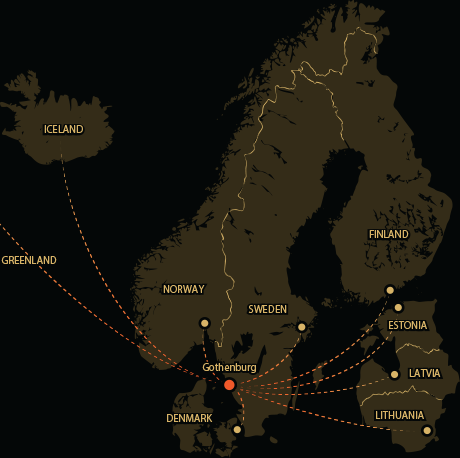 The company is a wholly owned subsidiary to Habanos S.A. Our Nordic head quarter is based in Gothenburg Sweden from where we distribute all Habanos brands throughout the region, from Greenland in the West to Lithuania in the East, a distance of more than 4.200 km. Our Nordic distribution network includes our own field sales force in Sweden and Denmark, while the rest of the region is serviced by local distributors and wholesalers. The main product for the company is premium Habanos Cigars, which is more than a tobacco product – it represents a life style. In our portfolio you will find everything from the super premium brand of Cohiba Behike to the low premium brand of Jose L Piedra. Both representing cigars made by hand of the excellent Cuban tobacco. For further information regarding our operations you are welcome to contact us through our contact page. The mother company Habanos, S.A. is a joint venture with the share capital 50%-50%, owned by Cubatabaco and Imperial Tobacco Group. Its corporate purpose is to market all Cuban tobacco products, both in Cuba and throughout the rest of the world, of which the internationally-known Habanos stands out. Habanos,S.A. was founded in 1994 to exclusively undertake the commercialization of all Habanos brands all over the world. The company is the world leader in the commercialization of Premium cigars, with a global market share of more than 70% in the segment. Maintaining a presence in over 150 countries, through its distribution network, more than 90% of the billing comes from the international business activity. The annual sale exceeds 400 million USD. Habanos D.O.P. (Protected Appellation of Origin): Legal term used to qualify the cigars bigger than 3 grams, elaborated in Cuba according to the quality standards of the Cuban tobacco Industry and using varieties of Cuban black tobacco grown in specific regions of Cuban territory, which are also protected as Appellations of Origin.